ACT Theatre recently produced a Grade-A classic by Tennessee Williams, “Cat on a Hot Tin Roof.” Now two more obscure scripts by this major (and prolific) American playwright are on view locally. Though it fizzled on Broadway, there’s a molten core of tragic poetry and scathing social critique vitalizing Williams’ “Orpheus Descending” — if you can thrash through some overripe dialogue, flagrant melodrama and a meandering structure to get to it. The Williams Project’s inviting, inventive staging of the 1957 drama kicks off Intiman Theatre’s summer festival, and brings forth this rich lava. The key to the swift-moving three-hour deconstruction? Not taking the script too literally, but creatively embracing its themes, quirks and excesses with ensemble verve. By Tennessee Williams. Through Aug. 2, 12th Avenue Arts, 1620 12th Ave., Seattle; $35-$45 (206-315-5838 and intiman.org). By Tennessee Williams. Through Aug. 1 at New City Theater. Info: 800-838-3006 and civicrep.org. 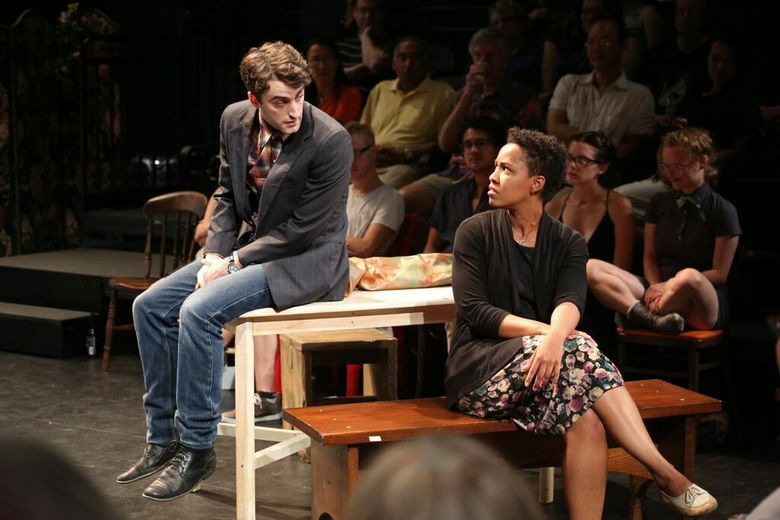 Ryan Purcell’s staging at 12th Avenue Arts encourages patron interaction. One can switch seats between the three acts, and some in the streamlined eight-member cast mill around to chat up the audience. “Orpheus Descending” opens with a Southern chorus of white biddies in a general store, clucking about the small-town neighbors we’ll soon meet. The store’s owner, Jabe (scary Max Rosenak), is an invalid, and more sinister bigot. He’s enslaved his younger Italian wife and shop manager Lady Torrance; not coincidentally, she too is played by a black actor, Kemiyondo Coutinho. Dreamers and social outcasts like Lady are often the victim-heroes of Williams plays, and there’s a quorum of them here: a boho rebel party girl (Elise LeBreton, in a punky tutu), a visionary painter (Rebecca Gibel), the “fugitive” wandering musician Val Xavier (Charlie Thurston). A handsome ex-hustler chasing redemption, Val hits town and begs a job from the wary but intrigued Lady. He’s an object of male loathing and female desire. But for Lady, he’s also a ticket to spiritual liberation, through art and eros. In this revisioning, Lady and Val (stand-ins for the mythic lovers Orpheus and Eurydice) are as sincere in their pathos and poetic reveries as their oppressors are flamboyantly comical or vicious. The tonal clash can be as jarring as the sight of a kiddie wading pool and plastic shower curtains in Ryan Dunn’s whimsical set. But the mash-up is entertaining, cunning and doesn’t trivialize the play’s tragic denouement. This hellhole Val plunges into is a 1950s Dixie backwater where one’s sexuality, race and nonconformity can be a death sentence. As Val, Thurston sings and plays accordion sweetly, but he’s light on the super-magnetism that makes Val such a dangerously irresistible troubadour. However, the vivacious, flexible acting ensemble finesses the split-personality concept. And it’s a credit to all that one can laugh heartily during Act 1 of “Orpheus Descending,” and feel the gut-punch in the play’s soberly disturbing finale. A rambling fever dream, this play-within-a-play considers two enmeshed thespians, a suicidal brother and histrionic sister (partly based on Williams and his mentally ill sibling Rose), who are trapped in a desperate psychodrama set in theatrical limbo-land. The production runs just 90 minutes (with intermission). But one soon tires of absurdist clichés, repetitive wrangling and traumatic flashbacks. “The Two-Character Play” (retitled “Out Cry” in a later version) debuted in the 1960s at a time when Williams’ own addictions (booze, pills) were ravaging his artistry and psyche. “I was thoroughly freaked out,” he said later. It shows.